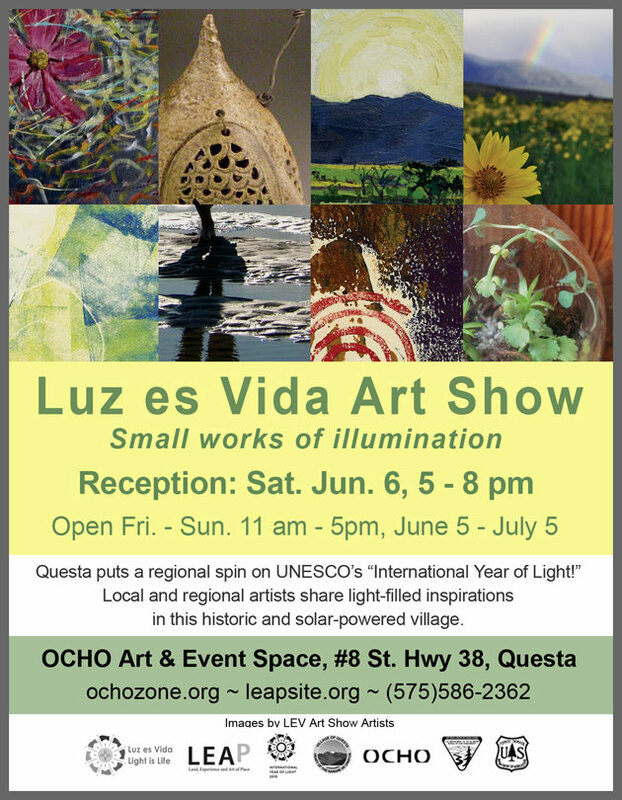 Gallery Hours: Fridays – Sundays 11 am – 5 pmThis summer the historic and solar-powered village of Questa is putting a regional spin on UNESCO’s “International Year of Light” with its “Luz es Vida – Light is Life” summer event series. On the most fundamental level, light is necessary for the existence of life itself through photosynthesis. Applications of light and light technologies have also revolutionized society through medicine, communications, entertainment and culture. Through the ages light has inspired and influenced countless scientists, creative thinkers and artists. The open call “Luz es Vida Art Show” is a venue for today’s local and regional artists to present their own light-inspired artworks. The show is curated by LEAP (Land, Experience and Art of Place), a program of the local nonprofit Localogy, and hosted by OCHO Art + Event Space in Questa. The “Luz es Vida Art Show” will feature works by over 25 local and regional artists in a variety of two and three dimensional mediums. 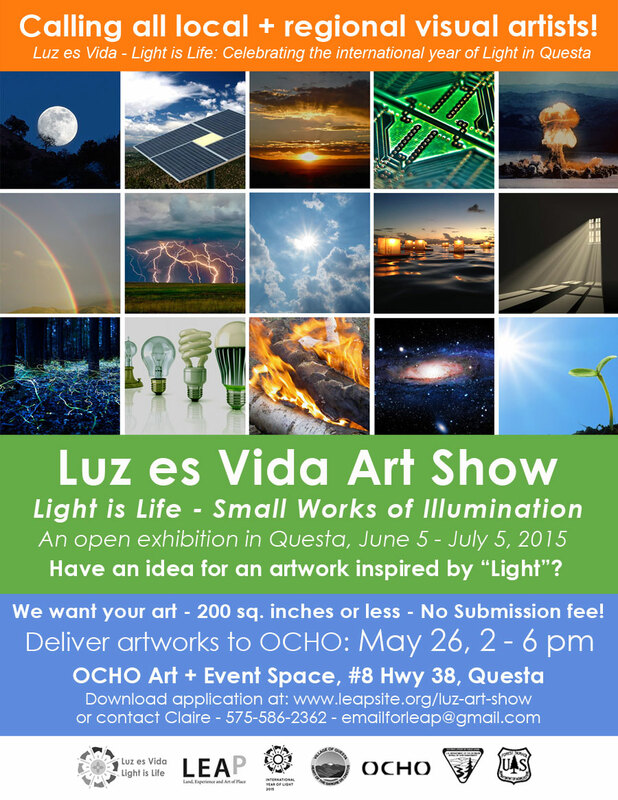 “The ‘Luz es Vida’ theme is a natural fit for the art show because light is key for so many artists. Light is an ever-present force in our lives and something to be noticed and celebrated!” explains Claire Coté, director of LEAP. The “Luz” show will include small works by photographers Sasha Vom Dorp and Phil Gruis, mixed media by Shiela Grace Wellspring, beaded sculpture by Audrey Kunkel, oil on canvas by Robert Perez jr. and Terry Davis, ethereal monotypes by Diane DeFremery and Jean Frey, clay lanterns by Sandra Harrington and much more; a wonderful sampling of northern Taos County talent! A public reception is to be held on Saturday, June 6th, from 5 – 8 pm. Hors d’oeuvres, drinks and music by Bittersweet Highway will add to the celebration. People’s Choice Awards in several categories will be announced at the end of the evening. The art show is part of Questa’s second annual themed summer event and education series collaboratively organized by LEAP, Questa Tourism Department, OCHO Art + Event Space, BLM Taos Field Office, and US Forest Service Carson National Forest, Questa District and other partners. “I love that we have such a great collaborative team working to pull-off these events. And it’s exciting that our little village of Questa is tied into this big, worldwide celebration of Light!” says Alberta Bouyer, Questa’s Tourism Director. 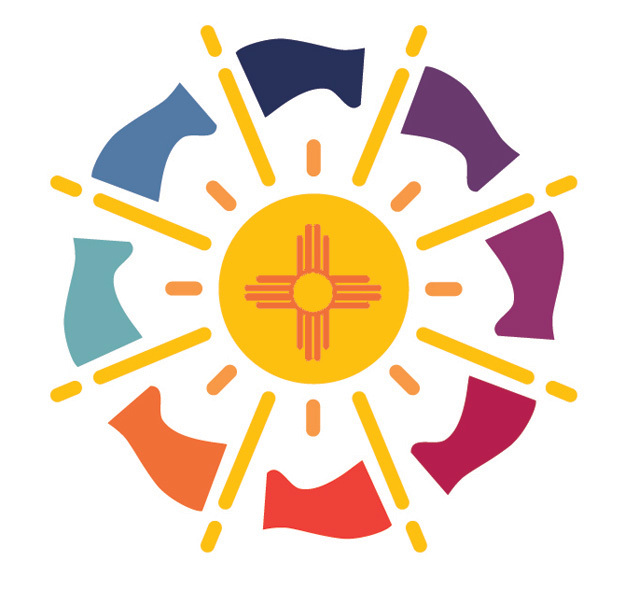 The “Luz es Vida” event series will continue with the not-to-be missed “Pecha Kucha Night – Rio Grande del Norte” on July 18th and the NeoRio event on September 12th, both at Wild Rivers in the Rio Grande del Norte National Monument. For more information about the upcoming art show or other “Luz es Vida” events or call the Questa Visitor Center at 575-613-2852.